Adrian Peterson left the game with 7 carries for 13 yards. The Vikings’ disastrous season could get even worse. Running back Adrian Peterson was carted from the sideline to the locker room after sustaining a foot injury in the second quarter of Sunday’s game against the Ravens. Head coach Leslie Frazier delivered an update, saying the All Pro running back has a sprained foot and will have an MRI tomorrow. 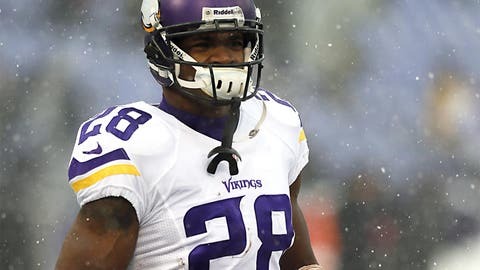 The Vikings scored 20 points in the fourth quarter without him but allowed 22, including a touchdown in the final seconds, to lose 29-26 and fall to 3-9-1 on the season. Peterson was brought down by Ravens linebacker Arthur Brown after a catch and run. He appeared to be in major pain, and trainers helped him off the field. When he got to the sideline, he was able to put weight on his ankle, but the trainers insisted he get on the cart. Peterson tore his ACL in his left knee in 2011 and ran for 2,097 yards the following season.